Corn and soy beans comprise a very large portion of GMO produce sold in the United States. 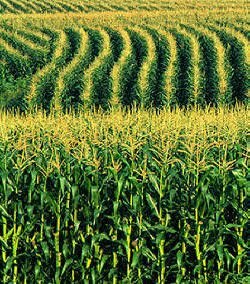 About 85% of all corn now sold in the U.S. is genetically modified. "Gilles-Eric Seralini of the University of Caen and colleagues said rats fed on a diet containing NK603 - a seed variety made tolerant to dousings of Roundup - or given water containing Roundup at levels permitted in the United States died earlier than those on a standard diet. "The animals on the GM diet suffered mammary tumours, as well as severe liver and kidney damage. The researchers said 50 percent of males and 70 percent of females died prematurely, compared with only 30 percent and 20 percent in the control group." Study authors reported that all three test groups of rats "experienced adverse health effects and died earlier than rats in the control group." "The results of the study presented here clearly demonstrate that lower levels of complete agricultural glyphosate herbicide formulations (such as Roundup), at concentrations well below officially set safety limits, induce severe hormone-dependent mammary, hepatic (liver) and kidney disturbances." Read the full report HERE. "A recent study showed direct links between glyphosate and embryonic abnormalities in frogs and chickens. The researchers saw obvious correlations between these animal defects and human birth defects recorded in areas subject to the spraying of Monsanto’s Roundup." Should GMO Foods Be Clearly Labelled for Consumers? Monsanto Corporation ($11.8 billion in sales in 2011) and a dizzying myriad of GMO food corporate-backers and their bankrolled scientists are loudly decrying the results this first long-term study of the effects of GMO foods on living creatures. Of course. More long-term tests of GMO foods are needed, though; one is never sufficient. But that's my point: these are the very first publicly released results of any study longer than 90 days of one of the most commonly sold GMO foods, corn. As far as I and others can find, no long-term studies have ever been performed of the effects on humans of GMO foods... at least none for which results have been released to the American public. As I reported here last month, the foremost concern about GMO foods is that no long-term studies exist to corroborate lobbyist and industrial food corporation claims about the health safety and benefits of genetically modified foods.... by universities, by the government, or by scientists other than those employed by the manufacturers and patent-holders. Well, we now have the first long-term study of GMO foods, and the dire results point disastrously to cancers and similar. Do Americans have the right to know what they're buying and eating? 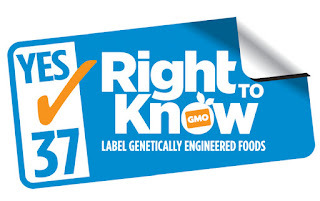 Should genetically modified foods be clearly labelled so that consumers can make informed decisions? I vote YES!!! For that reason, I will vote YES on California's Proposition 37. I urge all Californians to do the same: vote for freedom of choice and for clear labelling of our food supply. Vote YES on California Proposition 37.